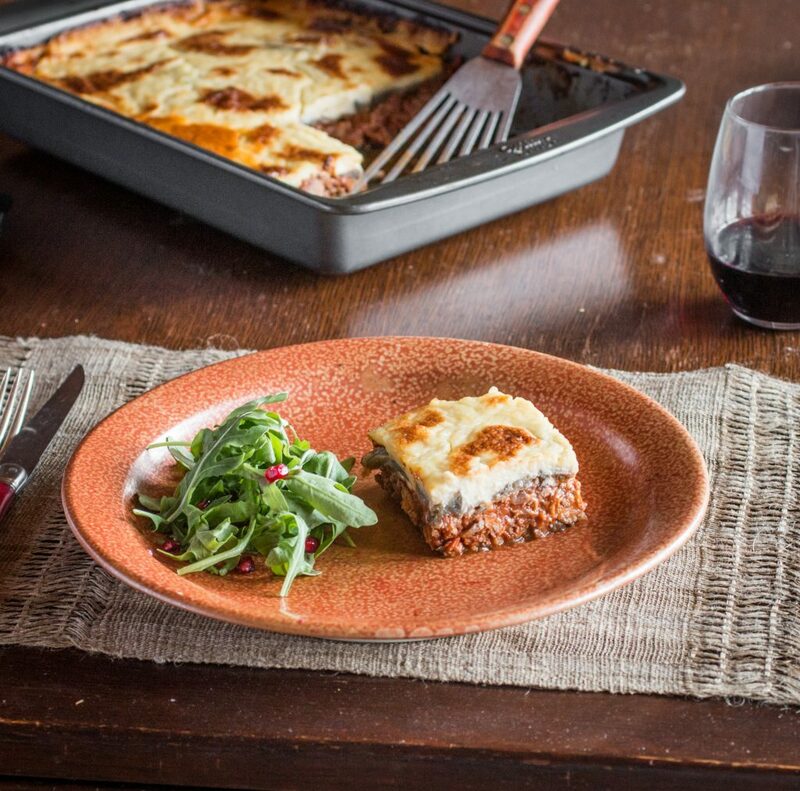 Layers of tender eggplant, and rich, spiced grass-fed lamb or goat ragu smothered in tangy goat cheese bechamel. Our lamb or goat mousska is a take on the classic, and with a little planning, it can be made ahead and feed a household for multiple meals for days. 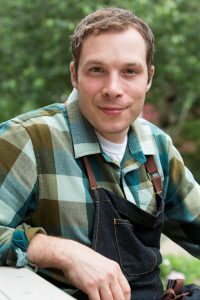 Chef Alan Bergo gives us his rendition here, which includes a goat cheese bechamel topping, a perfect compliment to lamb and goat. 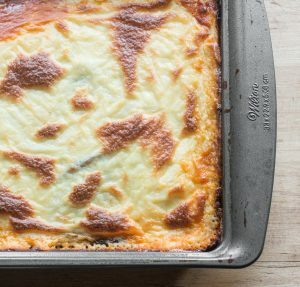 A classic dish from the middle east made famous in Greek Cuisine, moussaka is a bit like lasagna, and rest assured, If you like one, you’ll like the other. 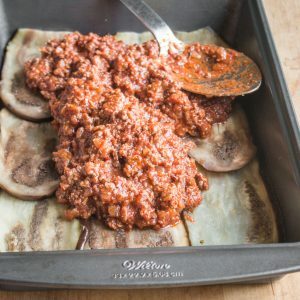 The methods for making both are similar, but instead of pasta, the moussaka uses thinly sliced eggplant, but potatoes, or even both can also be used for a different flavor. 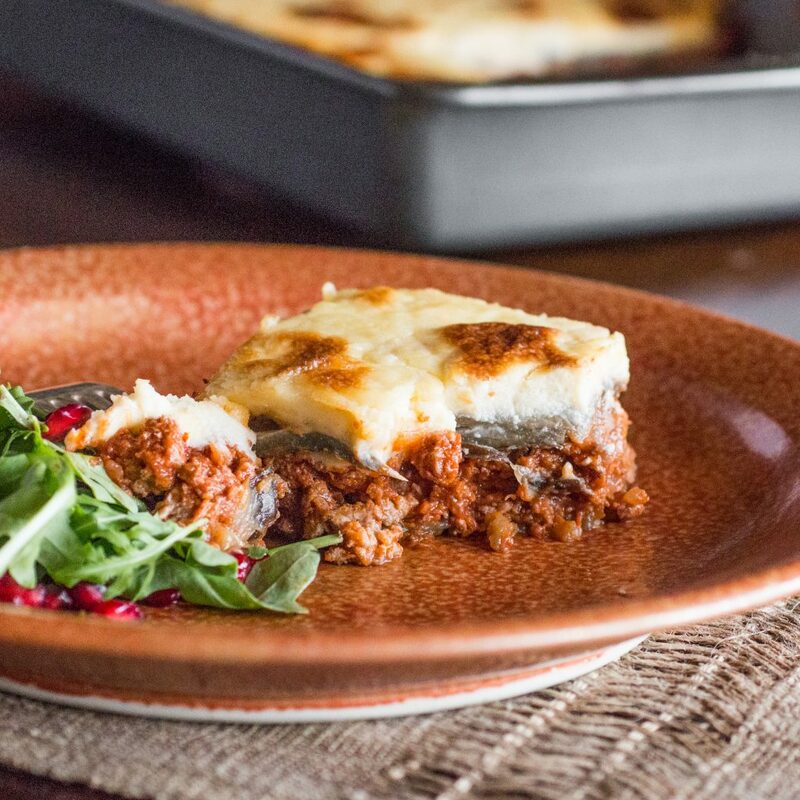 Another difference is that moussaka has a richly spiced sauce, our’s includes a combination of black pepper, cinamon, cayenne and allspice. The cayenne can be ommited if spicy food isn’t your thing, but the amount in the dish is very modest, and would be fine to serve to children and adults. Sweat the garlic in the oil until lightly browned, then add the onion and sweat for 3-4 minutes. Add the ground lamb, salt, spices and cook for a few minutes more, then deglaze with the wine, reduce by half, then add the tomato puree and simmer for 25 minutes on low heat. Allow the sauce to chill uncovered. The meat sauce can be made a day ahead of time. Melt the butter in a saucepan with high sides then add the flour and whisk to form a roux. Cook the roux for a few minutes, then whisk in the milk, a little at a time, whisking well after each addition. When all the flour has been added, simmer the bechamel on low-medium heat for 10 minutes, whisking here and there to make sure it’s smooth. When the bechamel is nice and thick, whisk in the cheese, then season to taste with the nutmeg, salt and lemon zest. Allow the mixture to cool for a bit, covered, then, when it isn’t hot enough to cook eggs (roughly 110 F) whisk in the egg yolks. Reserve the bechamel, but don’t chill it. For the eggplant, cut the eggplants into ½ inch rounds. Oil the rounds then season with salt and pepper. 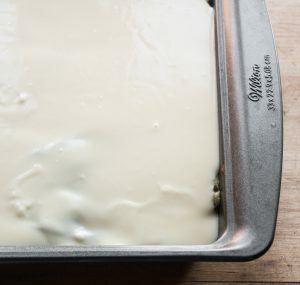 Bake the rounds on cookie sheets or sheet trays at 375 F until lightly browned and cooked through, about 15 minutes. You may have to work in batches. Cool the eggplant slices. 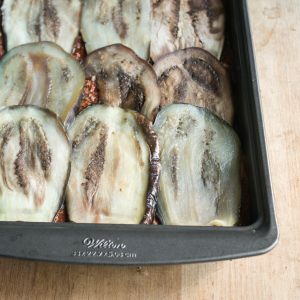 Take a baking dish, grease it, and line completely with a layer of eggplant, then spoon over the meat sauce. Top the meat sauce with another layer of eggplant, then top with the bechamel and bake at 375 for 45 minutes, or until the top is nicely browned. Turn the heat up during the last few minutes if you need to quickly brown the top. 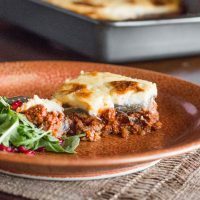 From here, the moussaka can be served and cut into squares after resting for 15 minutes, but it’s better to make ahead, as it firms up so you can cut perfect slices and, while also allowing the flavors to meld. Top eggplants with the meat sauce, then another layer of eggplant. Finish with the bechamel . After baking, you should have a golden brown crust.